Thinking of trying a Plant-Based diet but not sure where to start? This beginner’s guide walks you through everything you need to know to lose weight and achieve your healthy eating goals! This post contains affiliate links. For more information please visit my disclosure page here. Forget orange, plant-based diets are the new black! Recently I stumbled on to a few articles about the many health benefits offered by the whole food plant-based diet, and I could not drag myself away. Nutritionists, bloggers, and gurus all appear to be on the same page when it comes to this healthy eating weight loss plan: Plant-based diets are trending, and all signs point to great health. If you’ve been thinking of starting a plant-based diet, but you’re not sure where to begin, grab a cup of coffee, a glass of pinot, or your favorite smoothie, and get ready to find out everything you need to know about getting started! This beginner’s guide covers all the bases. Today you’ll find out why everyone and their mom is talking about the plant-based diet. We’ll review the benefits, how to meal plan to save some cash, what to eat & buy at the grocery store, what foods to avoid like the plague, what foods to get in your belly right now, and, finally, 30 plant-based diet recipes for breakfast, lunch, and dinner! Whole food, plant-based diets are heart healthy, environment-friendly, type-2 diabetes-fighting lifestyle eating plans that celebrate food and nourish your body. 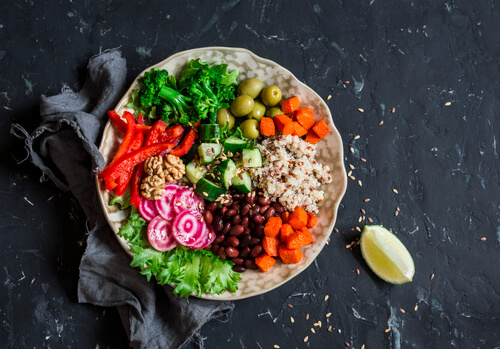 On a plant-based diet, you’ll focus on eating whole or non-processed foods and plants like vegetables, fruits, whole grains, legumes, seeds, and nuts. Psst: It’s not the same as vegan. I could go on & on about this, but I don’t want to confuse you, because it is VERY CONFUSING! You’ll see & hear people refer to the plant-based diet as vegan a lot. But they aren’t the same. Vegans don’t eat any animal products: no meat, no dairy, no eggs, no honey-because it originated from a conscious being. Sounds healthy until you think about what a vegan can eat. Technically, a vegan can eat Oreos & French Fries all day since they did not come from or use any animal product. Now, this isn’t the case on a plant-based diet. A plant-based diet is similar to vegan in that they both avoid animal products, but a plant-based diet takes it a step further and excludes all processed foods and fast foods-even the ones that are technically considered vegan. So no Oreos & Fries for you. Plant-based diets that are full of whole grains, legumes, and seeds support gut health by increasing the healthy bacteria in our GI tract. Both The American Diabetes Association and The American Academy of Dietetics recommend the plant-based diet for patients with diabetes. Heart disease is the #1 cause of death in women (& men) in the United States. Plant-based diets reduce your risk of heart disease by lowering blood pressure, improving cholesterol, and helping with weight loss. Recent research shows us plant-based diets may help with slowing the progression of some cancers due to the antioxidant content of whole plant foods like fruits and vegetables. With no calories or macros to count or portions to measure, many find plant-based diets easier to manage compared to other weight loss programs. Another contributing factor to weight loss on a plant-based diet is the fiber-rich fruits and vegetables which keep you feeling full and less hungry causing you to eat less. Last but not least, the elimination of processed foods and sugar also help lead to a lower number on the scale. Ask any nutrition expert what the number 1 tip is to lose weight, and he or she will tell you to meal plan! Meal planning is the best way to stick to every diet no matter what type it is! Here are a few of the many benefits of meal planning on a plant-based diet. Save Time & Money: Having a plan will eliminate last minute drive through dinners and meals and the dreaded “What’s for dinner” conversation! Those last minute runs to the store are costing you more than you think! Planning means choosing plant-based recipes with fruits & veggies that are in season & less expensive. Helps You Make Good Choices: Keeping the fridge & pantry stocked with healthy fruits and veggies will eliminate those midnight madness snacks. You know, when you raid your kids Halloween candy stash or opt to drive through Taco Bell because, hey, we’re busy people! Makes Grocery Shopping Easy: When you’ve got a recipe line-up, you can whip in and out of the store like a boss because you’ve got a plan! You make ONE trip to the store for everything. No more last minute trips! Do Not Spend All Day Meal Prepping!!!! Unless you want to get burned out or meal prep is your passion. In that case, go for it! Otherwise, set a timer for two hours & when it dings you are DONE! That’s enough time to prep veggies, legumes, cook grains, and pick out recipes if needed. Enjoy your weekend! Don’t do too much at once. You’ll be amazed at what you can accomplish in two focused hours! Set aside 45 minutes or so and select your recipes for the week. Save them on your phone by taking a screenshot or save them on a Pinterest board or go old-school and print them out! Just keep them someplace safe! This guide gives you 30 days of recipes for breakfast, lunch, and dinner, so you have time to develop a system that works for you going forward! Find recipes you can double or you know will allow for leftovers you can eat for lunch. You know, Monday night’s chili turns into Tuesday’s Taco type of thing! I’ve included several multi-purpose plant-based recipes below in case you’re interested. See chili, soups, and [vegan] burgers. Cook up a big batch of whole grains like brown rice, quinoa, or barley to go with your weekly meals on Saturday or Sunday. Soak & cook chickpeas and beans on your preferred meal prep day. Then portion them out for salads, buddha bowls, and chilis. This process will not take up your entire day, but it will save you tons of time later in the week! Start with simple recipes and build your way up. It’s easy to get overwhelmed with a gorgeous Pinterest 15-step recipe and wear yourself out. Start with easy recipes! Ok. So, you need a little more to go on than just “no processed foods” and “eat healthy grains” when you go to stock your pantry for the first time, right? Here’s a fantastic plant-based starter list of the most nutrient dense vegetables, fruits, grains, legumes, nuts, and seeds. Remember-you don’t have to buy all of these! To keep costs down, buy fruits and veggies that are in season and buy in bulk when you can! Ready to shop? Ready to find out if the whole food, plant-based lifestyle is right for you? Here are some of the most delicious, protein-filled plant-based recipes for beginners for breakfast, lunch, and dinner! If you enjoyed this collection of plant-based recipes, please share it on Pinterest! You can find more healthy recipes & tips on my board, Clean Eating Recipes!